The new Ultra High Definition 4K resolution is making a big splash in home theater. At four times the resolution of 1080p, 4K brings picture detail to a whole new level. In the projector world, the recent release of two high-profile products - the Epson PowerLite Pro Cinema LS10000 and the Sony VPL-VW350ES - has drawn even more attention to Ultra High Definition. Both projectors will display native 4K source material, but the Sony VW350ES does it with native 4K resolution imaging chips, while the Epson LS10000 uses native 1080p chips and a 4K enhancement process. To make the competition even more interesting, Sony has announced a temporary introductory sale price of $7,999 on the VW350ES, putting it exactly at the price of the Epson LS10000. So the big question is how do these two projectors stack up? Which is the better for the money? Let's take a look. Update 1/27/15: Epson has revised their estimate of the laser's lifespan in High brightness mode to 17,000 hours. We have edited the "Light output" and "Light sources" sections to reflect this change. Contrast. The LS10000, with a Dynamic Contrast system and a laser light source, has a visible advantage in on/off contrast and a much deeper black level in dark scenes where black is predominant. In rolling credits, the black background is more deeply solid black on the Epson. However, in most cases the VW350ES has higher contrast within any given frame. In scenes of average or above average light level, its picture not only appears higher in contrast, but also has a black level much closer to that of the LS10000. Both projectors also feature user-adjustable gamma curves, though the factory settings on each were quite good. Light output. A projector's light output can change dramatically based on how it is installed and how you plan to use it, so it's best to consider these factors before making a purchase. On the LS10000, some folks will opt for Cinema mode, which creates a theater-quality image at 1275 lumens. Others will prefer THX mode (1095 lumens) or Digital Cinema (1038 lumens) for their reference-quality color accuracy and wide color gamut, respectively. On the VW350ES, Reference mode is the obvious choice with 1370 calibrated lumens. It is both brighter and more accurate than its other theater-appropriate image mode, Cinema Film 1. The VW350ES loses fewer lumens when using the zoom lens (25% versus 31% at maximum telephoto) and has less of a decrease in low lamp mode (21%, versus the LS10000's 24% in Medium or 45% in Eco). The decrease in light output due to zoom is a straight-line decrease, so someone using the midpoint of the zoom lens would see a 12.5% drop on the VW350ES and a 15.5% drop on the LS10000. For installation planning purposes, you should also consider how a projector's light source will lose brightness over time. The VW350ES uses a high pressure lamp that is expected to lose brightness relatively quickly over the first 500 hours of use, then degrade more slowly thereafter. The LS10000 uses a laser light source that is expected to lose brightness slowly on a straight-line basis over its lifespan. We initially reported on a 10,000 hour lifespan for the LS10000 at full brightness, but Epson has since revised that number to 17,000 hours. Since light source lifespans are based upon the time they are expected to reach 50% of their initial lumen output, the LS10000 should see a straight-line 25% decrease in light output over 8,500 hours of use. Historically, high pressure lamps degrade by 25% in roughly 500 hours, though this is an approximation. We have no way to predict precisely how fast lamps in the VW350ES will lose brightness, and Sony does not publish anticipated lamp life statistics. Assuming for the moment that the VW350ES's lamp will in fact degrade by 25% in 500 hours, the LS10000 would lose 1.5% of its brightness during that same time period. The VW350ES loses brightness more quickly than the LS10000, so after several hundred hours the VW350 becomes less bright than the LS10000 until you change the lamp. Replacement lamps run $499 on this model. The good news is that the VW350ES can always be periodically returned to maximum light output with a new lamp, whereas the laser light source on the LS10000 cannot be replaced. Color. Both projectors have comprehensive color controls that allow adjustments to both grayscale and gamut, so color can be dialed in with precision through professional calibration, which for a small additional investment will ensure that you obtain peak performance from either projector. The LS10000 includes support for the DCI (P3) color gamut via its Digital Cinema mode, which places a filter in the light path but slightly reduces light output (1,038 lumens) versus THX mode (1,095 lumens). Image Resolution-1080p source material. Until there is a wider selection of 4K content, owners of 4K projectors will probably spend most of their time watching 1080p content. 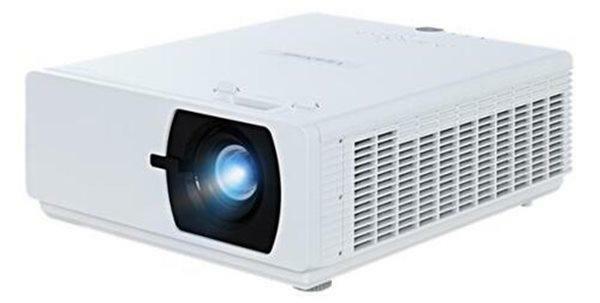 When displaying 1080p source material on the Sony VW350ES, rather than straight no-frills line doubling, the projector analyzes each frame of the input signal and interpolates to 4K to reduce jagged edges, maximize detail clarity, and create smoother color gradations. This is tied to the projector's Reality Creation system, which is controlled using two sliders (one for resolution and one for noise reduction) that run from 0-100. Even if you're usually not a fan of smart sharpening systems, we recommend leaving Reality Creation turned on even if you have both sliders set to zero. There is a marked difference in detail between Reality Creation set to zero and Reality Creation turned completely off. On the Epson LS10000, you can adjust the degree of 4K enhancement to be applied in the Super Resolution menu. These options are labeled 4K-1 through 4K-5. In our side by side testing, we opted for a moderate 4K enhancement effect using either 4K-1 or 4K-2; at very short viewing distances it is easier to spot edge enhancement artifacts, however minor. The optimal setting is dependent upon several factors: the type of material being viewed, the viewing distance of the audience, and the viewer's personal taste. In our tests with Blu-ray material, both projectors rendered images with much higher apparent resolution than a standard 1080p projector. However, the VW350ES had an incrementally cleaner, clearer, more natural picture with better definition in super-fine detail and less digital noise. This advantage was most evident in images with an abundance of detail, but even less detailed content showed it to some degree. Image Resolution - 4K source material. Our 4K tests used demo material from a Sony media server, short clips from a REDRAY player, and test patterns from the DVDO AVLab test pattern generator. With 4K content instead of 1080p, the VW350ES again had the advantage in fine detail resolution. But the gap between the two projectors narrowed, making the difference in image clarity less evident than it was when upscaling 1080p. Fine details that were crisp on the VW350ES appeared slightly softer and less defined on the LS10000. It is impressive how close to native 4K the LS10000 was able to come with its enhancement technique, but there is still an apparent benefit to the VW350ES's native 4K chips. Viewing distance. In our review of the VW350ES, we mention seeing differences between 4K and straight 1080p as far back as 2x the screen width, but the differences were more obvious at a viewing distance of 1x screen width. When comparing native 4K against the LS10000's 4K Enhancement, the range at which we can make those distinctions is even smaller. We could not see much difference in fine detail between the VW350ES and LS10000 if seated at more than 1.3x the screen width. Past that distance, both projectors still look much higher in resolution than straight 1080p, but it becomes difficult to say with conviction that one looks more detailed than the other. Thank you for the review, Bill: Please comment fully on the comparison between the 350 and the 10K detail resolution -using 1080P material. This is a fair review. I believe the VW350ES and it's big brother are closer in consumer cost than some may think, though. Given this review, it seems the VW600 is the ideal choice if comparing the 3, and the VW350ES wins out over the Epson in a direct comparison. I'm not sure who would purchase an upscaling to 4K projector vs. a native 4K projector. We're in the middle ground of technology right now, so only early adopters will even take on a 4K projector - but IMO even fewer would take an upscaling, when it's the same price! I still have not heard of a release date of the LS10000 in North America, does anyone know when its available to consumers? Very frustrating that epson is not releasing these details. Disregarding the unknown lifespan of the Epson laser light source - the Epson has as good picture as Sony at a realistic viewing distance, and it makes non 4k material look much better - closer to 4k than to HD. The Epson will allow you to see much improved HD material right here and now, which clearly increases its functional value over a pure 4k that does not have access to true 4k material. My vote for Epson. Jorgen -- sounds like the Epson would work for you. However, upscaling of 1080p is an advantage that both projectors share -- it's not unique to the LS10000. And since viewing distance is mostly based on personal preference, your statement about what constitutes "realistic" is inherently subjective. Bill: how would you compare motion blur on two models, during fast action scenes? I'm interested in hearing more about it. Bill aren't you saying that I need to sit within 10 feet from my 135 inch screen to see the difference between the two projectors? At 13 feet it's a wash? Please correct me if I am wrong. I used the term "realistic" as I have yet to see anybody who want to sit as close as 10 feet from a 135 inch diagonal as it almost requires headmovements to see all of the screen. True, viewing distance is partially subjective, but the angular resolution of the human eye is about 60 pixels per degree, and as such measurable and predictable with limited subjectivity. If I am not mistaken, the resolution advantage of a 4k 50 inch tv may be lost after 6.5 feet, and a 100 inch after 13 feet. Jorgen - The difference in detail and resolution between the VW350 and the LS10000 is most visible when viewing from, at most, 1.3 times the screen width. With a 135" diagonal 16:9 screen, that means sitting at a distance of 12' 9" or closer. When sitting farther away, the VW350ES won't have much of a visible resolution advantage over the LS10000. At your preferred seating distance, the detail difference between the two is a factor you don't need to consider. The other differences between the two aren't dependent on throw distance, so you'll be able to see them no matter where you sit. Regarding your other points: We have a longer discussion on human visual acuity in the VW600ES review, under "The Viewing Experience." You should check it out. Short version: it's a little more complicated than that. With the epson ,the fact of unknow if in the future we will be able to replace the laser source scared me a lot. The light source will dim every minute and 30000 hours means 50% of the original bright. Of course that this can in almost cases many years, but also means that the light source will never be bright " as new again". The projector without the possibility to have the light source replaced is the unique electronic peace I bought with "time to die" well know. Even with these conditions in mind I brought one. I would like to know the general consideratios of other users about this.